Pamir Ehsas is a law student, a Summer Institutes for European Student Leaders alumnus, the CEO of two NGOs, and a refugee from Afghanistan who was given a second chance in Norway. He came to Norway with his family when he was only seven years old, but he never forgot the experience and has since devoted his time to helping other children from Afghanistan have the same opportunities he has been given. Pamir was chosen for the Summer Institutes for European Student Leaders program and credits his experiences through the program as being the catalyst that gave him the confidence and knowledge to start changing the world. After this experience, he created his first NGO, “Brighter Tomorrow,” which aims to educate young Afghans on how to be responsible and active citizens in order to create a more peaceful society. The project focuses on children who are vulnerable, misplaced, and marginalized, such as child laborers, girls, and children with disabilities. Pamir’s successes do not stop with starting his own NGO. At the age of 20, he was one of ten Norwegian youth to “take over” one of Norway’s biggest newspapers Aftenposten, for a day and is now a columnist for the same newspaper. 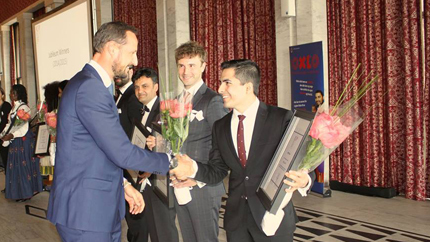 Pamir was named the 2015 “Young Leader of the Year” and given the award by H.R.H. Crown Prince Haakon of Norway. He was selected to represent Norway at the United Nations this summer, where he participated in panel discussion with Ban Ki-Moon about youth and peacebuilding. Pamir has also interviewed his Pashtun heroine Malala, a fellow young activist for education. Having turned 21, what was Pamir’s next goal? He founded and is the CEO of “Studentaksjonen” – an annual nationwide fundraiser to help more students in Afghanistan. In its first three hours, the fundraiser raised enough funding to provide schooling for 427 children in Afghanistan through the Norwegian Church Aids projects in Faryab, Afghanistan. More than 600 students volunteered and together they raised USD 47,000. Pamir continues to be involved with other U.S. exchange alumni and with programs which allow him to speak to his community about the effects of his exchange. He recently spoke at the U.S. Alumni Fall Reception where he addressed Fulbright, International Visitor Leadership Program (IVLP), and youth alumni about his exchange experience and how it has influenced him. Pamir’s goals are simple yet complex: changing the world for the better. He has and will continue to use the skills and knowledge he gained from his experience in the Summer Institutes program. Each month, the Bureau of Educational and Cultural Affairs’ (ECA) Alumni Affairs Division, which supports alumni as they build on their exchange experiences, recognizes one outstanding alumnus or alumna. Pamir Ehsas is this month’s outstanding alumnus, and his work will be recognized throughout October on the International Exchange Alumni website, ECA’s official website which serves more than one million Department-sponsored exchange alumni worldwide.